2018 was another record-breaking year for the tourism industry in Louisiana, with the state seeing more visitors than ever. 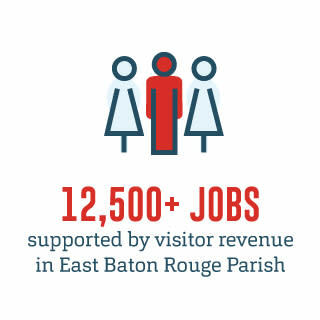 Being one of the largest industries and the fourth-largest employer in the state, Louisiana and the capital city of Baton Rouge depend on the travel and tourism industry’s ability to create jobs, stimulate economic recovery and drive needed tax revenue. Visit Baton Rouge and our local tourism industry partners work to promote the city of Baton Rouge, both domestically and internationally, to attract business and leisure travelers here. When a destination attracts visitors, everything from local businesses to public services and residents win. What does tourism mean for Baton Rouge? WHEN VISITORS COME TO BATON ROUGE to experience our unique flavor and flair, the revenue that’s generated improves our city. It supports the rise of small businesses, creates thousands of jobs and attracts new events and entertainment for families across our communities to enjoy. To learn more about what Visit Baton Rouge goes for leisure travel and tourism, click here. To learn more about what Visit Baton Rouge does for business travel and tourism, click here. A stronger tourism industry allows Baton Rouge to better compete with other similarly-sized cities for entertainment opportunities. That means more sporting events, concerts, restaurants, conventions and more for you and your family to enjoy. Gives back to local communities. Travel and tourism creates jobs and generates tax revenue for local communities, which in turn, help pay for important public services. Provides essential support to state and local governments. Travel generated $1.04 billion in total tax revenue in Louisiana in 2016. That means the tax revenue generated through travel and tourism spending saves each household in Louisiana $601 a year in taxes that would be needed to maintain current revenues. Creates a virtuous cycle of economic benefits. Travelers visiting a destination spend money at local attractions, hotels, retail, restaurants and on transportation. 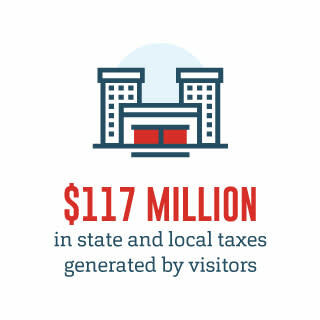 Travel spending supports local jobs and generates additional tax revenue for state and local governments to invest in enhanced public services for residents and visitors alike. Helps destinations attract visitors and businesses. Destinations that are able to provide a range of travel-related offerings are not only likely to draw more visitors, but also attract new businesses and skilled workers. Leads to faster growth than other regions. Destinations with a higher concentration of visitor-related industries tend to grow faster than other regions. Not only does travel and tourism create jobs in its own industry, but it also improves the quality of life for residents and has a positive impact on perceptions of a destination for residents, potential employees, students and businesses. 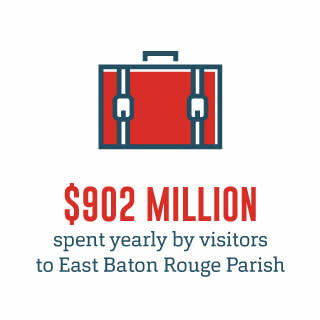 Travel and tourism efforts by Visit Baton Rouge are funded by the Hotel Occupancy Tax — a tax visitors pay. Learn more about the Hotel Occupancy Tax here.